I had a 1977 Yamaha Yz400 for sale or trade but I'm not interested in trading any longer..just a straight sale. The old YAMAHA YZ400 STARTS RUNS STARTS IN A COUPLE OF KICKS and IDLES AWESOMELY! THE VINTAGE MOTORCYCLE SHIFTS GREAT and has a 5 SPEED GEAR BOX. The FAST dirtbike has the bright yellow paint that is extremely hard to find. If you're interested in buying the motorcycle please call me and let me know that you found my classified on GoGoCycles Used Dirt Bikes and let's make a deal! GoGoCycles would also encourage bikers to submit a review of the 1977 Yamaha Yz400 for sale or Trade to help potential buyers make informed decisions and to benefit the biker community as a whole. 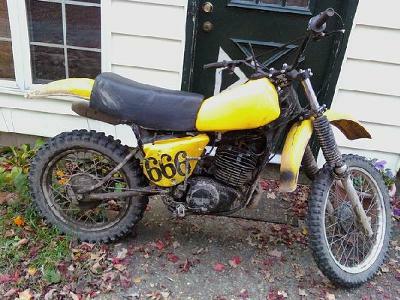 The location of the used Yamaha dirt bike is ADDISON (near Jackson) and in my opinion my asking price for this setup is cheap enough that it will be difficult to beat on Craigslist or on Ebay; just $$700 or you are welcome to submit a best offer but NO low ballers! If you want to take a look or have questions, call me (NO EMAILS) at 517 662 03nine9 for more details or to request picture and don't forget to mention that you found this ad on GoGoCycles Used Motorcycles and Parts for Sale www.gogocycles.com.